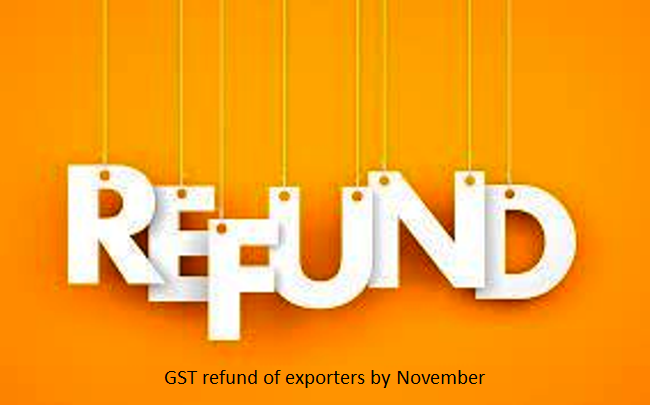 The government will clear pending GST refunds of Exporters by November-end and over the next six months no tax will be levied on exports as the Council has decided to revert to the pre-GST era, Revenue Secretary Hasmukh Adhia said. Over July-August, an estimated Rs 67,000 crore has accumulated as the Integrated GST (IGST), of which only about Rs 5,000-10,000 crore will be due as refunds to exporters, he said in an interview to a news agency. While no tax will has to be paid on goods to be exported in the remaining months of current fiscal, from April 1 an e- wallet service will be launched that will give exporters notional credits that can be used to pay GST, he said. The credit in the wallet would be transferable. The Goods and Services Tax (GST), the amalgamation of over a dozen indirect taxes like excise duty and VAT, does not provide for any exemptions, and so exporters are required to first pay Integrated-GST (IGST) on manufactured goods and claim refunds after exporting them. This put severe liquidity crunch, particularly on aggregators. o ease their problems, the GST Council on Friday decided a package for them that includes extending the Advance Authorisation / Export Promotion Capital Goods (EPCG) / 100% EOU (Export Oriented Unit) schemes to sourcing inputs from abroad as well as domestic suppliers till March 31, thus not requiring to pay IGST. For a period of 6 months we are actually reverting back to the pre-GST scenario (where manufacturing exporters or those who manufacture goods for exports did not pay any tax). So, they have no reason for any complain now,� he said. A nominal 0.1 per cent tax will be levied on merchant exporter as they themselves do not manufacture. Under GST even a merchant exporter who collects goods from many producers and exports has to pay full rate of duty and seek refund. But, he is only an aggregator. So, that was the problem and it has been sorted out, he said. The refunds to exporters would be settled, and resolved in a month or two�. After March 31, there will be a system of e-wallet, where a notional credit will be made into the holder�s account so that the same could be used for payment of GST after March 31st. The credit would be made to exporters based on their past performance or on the basis of export orders in hand, he said, adding this would mean no hard cash is spent on taxes. It is possible that the manufacturing exporter himself has no liability to pay, but the supplier who gave him inputs may have. So, he can transfer credit (from e-wallet) to the supplier account. So, the e-wallet would be transferable, just like any other wallets, but the only restriction is that it can�t be given in cash, it can be only used for payment of duty,� he said. After executing the export order, a refund application will have to be made and the refund will be credited in form of credit to the same e-wallet. So, his account will get replenished by the refund. So, the refund process will take place, but he is not deprived of funds and will not have to invest his own working capital. Liquidity will be maintained with him,� he said. Adhia said with these measures, issues faced by exporters have been taken care of. �It�s an innovative idea that we have come out with, while not compromising on GST�s basic structure wherein ideally exemption should be given�. On refunds on taxes paid already paid since introduction of GST in July, he said the rules provide that if IGST is paid on export, immediate refunds should be made. But, since that system is not ready, the refund claims of July totalling about Rs 600 crore will start from October 10 and another Rs 800 crore for August from October 18, he said. However, for claiming the refunds, exporters have to fill Table 6A while filing GSTR-1 for July, August and September.